The Hydra-Matic 6T45 (production code MH7) is a six-speed automatic transmission produced by General Motors for use in front-wheel-drive vehicles with a transverse powertrain orientation. Developed in-house by General Motors, the Hydra-Matic 6T45 is part of the 6TXX family of transmissions that succeeded the 5TXX family. 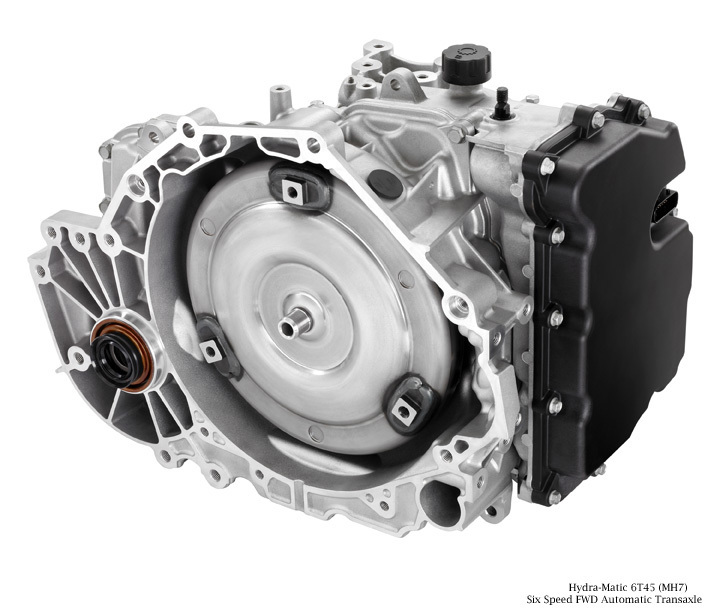 The 6T45 is a more robust version of GM’s 6T40 MH8 transmission, with the two gearboxes sharing many components. The 6T45 MH7 in particular is designed to be used in front-wheel drive vehicles. Its all-wheel-drive brother is the 6T45 MHC. Six-speed automatic transmissions are integral to GM’s initiative to offer vehicles with excellent fuel economy and driveability. Designed for FWD and AWD applications, they are used in many of GM’s most popular models. The 6T45 contains all of the gearing in line with the crankshaft centerline of the engine. The advantages of this layout translate to a shorter overall vehicle length, more interior room and lower powertrain height. Three planetary gearsets are used with three stationary clutches and two rotating clutches, which save space compared to freewheeling designs. Freewheeling mechanisms allow mechanical control between shifts, but also take up more space and add components to the transmission. The 6T40 and 6T45 feature “clutch-to-clutch” controls and advanced electronics to deliver precise shift timing and great driveability. Gear changes from second to sixth gear ratios are accomplished with clutch-to-clutch action, where the clutch is engaged in one gear at exactly the same time it is released in another. The first-to-second upshift, uses a freewheeling mechanisim, where the second gear clutch engages while the first gear one-way clutch spins freely upon release. This allows a greater degree of smoothness at lower vehicle speeds. Adaptive shift controls include automatic grade braking, which commands the transmission to remain in a lower gear if the vehicle is decelerating or coasting on a downgrade. This takes advantage of engine braking to prevent unwanted acceleration. This reduces the need for the driver to brake during a hill descent. The control module receives input that monitors brake pedal usage, vehicle acceleration rate, throttle position, and even whether a trailer is connected to the vehicle. The torque converters in the 6T40 (205 mm) and 6T45 (236 mm) use a single-plate lock-up clutch and features a “hyper-elliptical” oval cross-section shape. 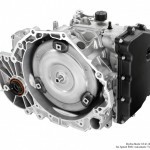 This design reduces the thickness of the torque converter, reducing the space it needs and keeping the overall width of the engine and transmission as narrow as possible, for underhood packaging advantages. The single-plate lock-up clutch uses GM’s electronically controlled capacity clutch (ECCC) technology to help isolate engine vibrations and provide smooth torque converter clutch apply and release operation. A compact on-axis, fixed-displacement IX gear-type fluid pump provides hydraulic pressure for shifting and lubrication. The pump features an IX gear (Drive/Driven) with a machined crescent in the pocket to reduce internal leakage and optimize hydraulic efficiency. The inlet jet nozzle feature in the IX gear-type pump provides for increased pump suction pressure, which helps optimize noise and vibration characteristics. To minimize gear noise, as well as vibration, the helical gears are ground and honed to ensure precise dimensional control. With good dimensional control, the transmission operates with exceptional quietness. Both the 6T45 and 6T40 are part of GM’s 6TXX family technologically advanced, fuel-saving six-speed automatic transmissions. The 6T45, however, is a more robust unit and is rated for greater torque capacity due to specific component enhancements compared to the 6T40. To enable greater torque capacity, the 6T45 features a 1.25-inch-wide output chain, versus a 1-inch-wide chain in the 6T40. The input gear set of the 6T45 uses five pinion gears, versus four pinions for the 6T40. The case of the 6T45 is slightly larger to accommodate the larger chain system and includes enhanced case ribbing for additional strength.